In 2017 I was invited to participate in an artist residency at Salem Art Works (SAW). During my time at SAW, I formed intense bonds with artists engaged in a variety of artistic explorations. Just as most good and unlikely ideas form, Executive Director, Anthony Cafritz and I conceived of this project late into the night in his kitchen over beers with a small group of people. 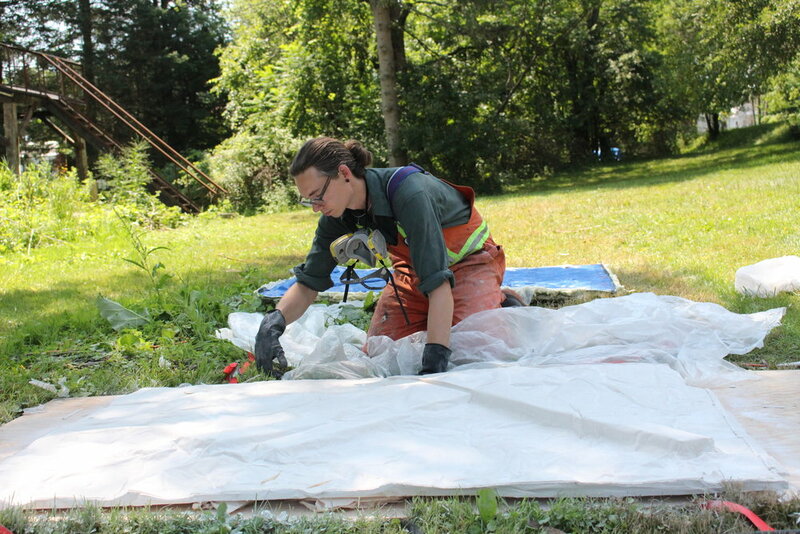 Edmonton to Salem brought ten artists from Edmonton, Alberta to attend a four week artist residency at Salem Art Works in Upstate New York during July, 2018. Artists produced an independent body of work through a self directed structure of mentorship and skill sharing. This residency provided artists with international exposure and Edmonton artists became envoys of Canada, engaging in a cross cultural exchange. The residency included public art talks, multiple group critiques, a trip to MASS MoCA, workshops in ceramics, glass blowing, blacksmithing, an aluminum pour, and studio visits with artists Danny Goodwin and Adam Frelin. 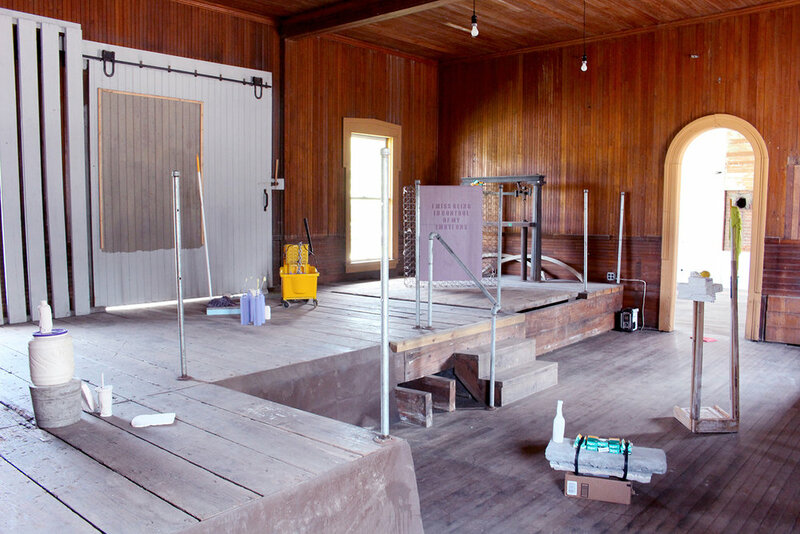 The residency culminated in an exhibition at North Main Gallery and the Historic Salem Railroad Station, in Salem, NY. This exhibition was an opportunity to underscore the breadth of diverse activity occurring in the Edmonton art community. Bringing a project of this scope together always involves the combined effort of numerous individuals, and I would like to thank Executive Director of Salem Art Works, Anthony Cafritz for his unwavering support. I would also like to acknowledge the hard work of Jenny Hillenbrand, Pearl Rucker, Zach Ward, and all of the employees at Salem Art Works. Further thanks to Associate Professors Adam Frelin and Danny Goodwin, University at Albany, for their studio visits and for their terrific work on the introductory essays in the catalogue. A special thanks to Roy Mills, University of Alberta, for his advice and ongoing mentorship. Finally, it is important to acknowledge the support of the funding agency whose generous support made this project possible. Thank you Canada Council for the Arts. 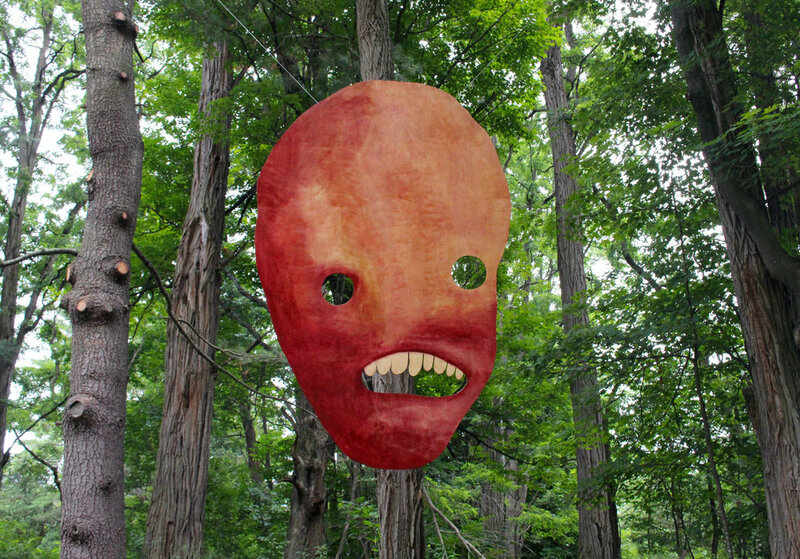 Salem Art Works (SAW) is a not for profit art center and sculpture park located in rural Upstate New York. Founded in 2005, SAW is dedicated to supporting both emerging and established artists in the creation of new and progressive work, as well as promoting the understanding and appreciation of contemporary art within the region. Salem Art Works operates as a collaborative community. Artists and staff live and work together, forging friendships, sharing experiences and exchanging ideas. SAW provides residence with living accommodations, studio space, and full access to their wood shop, metal shop, ceramics studio, blacksmith shop, glass shop, iron foundry, print studio and exhibiting spaces. The center is located on 120 acres of open, rural landscape and includes the Cary Hill Sculpture Park. This park exhibits sculptures by regional, national and international artists on a rotating and semi permanent basis. The use of blue plastic tarps and dimensional lumber such as “two by fours” are recurring objects in my work dealing with the current image-centric culture I live in. My goal in creating these trompe-l'œil rendered objects is to make physical representations of the intangible representations which images and screens put forward for consumption. This results in an object which materializes the ways in which we choose to dematerialize the world through various apparatus. The result are a series of objects which upon careful scrutiny are discovered to be hollowed out, distorted, superficial, purely surface, and rigid where it should be malleable. Such is the material condition of the image which is quickly being pasted over experience and consuming the real. The repeated use of the plastic tarp in my work is referential to the ways in which representations cover and occlude the original, surpassing the position of simulacra and becoming what Umberto Eco describes as the “authentic fake” or the “copy with no original”. The dimensional lumber complimenting the brilliant synthetic blue glow of the tarp is a familiar object but forgettable in every way. The lumber’s common reading of having not yet been assigned to a “use” invokes the familiarity and invisibility of the screen. A form which is deemed formless until it (or the viewer) is activated by the message. The discovery of this sculpture’s high fidelity-infidelity is for many, amazingly sublime, yet still incredibly banal. While at SAW I worked on two separate but complementary projects. Other Architectural Forms and Basic Laminated form with Brick Texture expanded my current studio practice which typically employs printmaking and sculpture to respond to architectural ornamentation, cheap buildings and dimensional flattening. At SAW, I had the opportunity to work with both real structural materials and the stuff of facades, rather than depend on image-based production. Other Architectural Forms looked to the ubiquitous classical column and replicated its over-use in cheap architecture. The columns I constructed were like stage sets: hollow, thin and non-structural. The play between believably solid and visibly transparent extended itself through the use of materials: corrugated aluminum, drywall tape, chicken wire and plaster. The other work, Basic Laminated form with Brick Texture was installed at the Cary Hill Sculpture Park and is a building-like form made of brick and mortar. I began working on this project with a desire to handle concrete building materials and a need to sketch with brick. During the residency I used 400 bricks to sketch six different forms before arriving on the final version, which is L shaped and nestled in a small clearing. The form opens up at the front in a stepped fashion revealing a gap in the structure. Approaching a foundation or a small structure, it is neither. It is a folly, suggesting human scale but not large enough to enter. At SAW I expanded on my interest in utilitarian objects which support the day to day function of people and ask to be useful. The sculptures are representational but improvised in form and undermined by materiality. They are dysfunctional approximations. The plaster crawls over the objects like plaque, altering surface, obscuring form, and interrupting action. The pieces become ruins; fragile, still, and fragmented. I see this body of work as an exploration of memory as a utility, with the forms standing-in for our bodies; I am asking what becomes of us when memory is disrupted or deteriorates. Working alongside people living with degenerative cognitive conditions such as dementia and Alzheimer’s disease has lead me to question the role of memory as a device; a tool for situating ourselves within the context of our own lived experiences. How do our experiences change when that device is impeded? In the studio I deconstruct, adapt, replicate, and rebuild until materials surpass their original qualities and begin to interfere with themselves. Like memories, my sculptures and drawings are a series of elements assembled out of context, a collection of incomplete thoughts suspended in physical form. "Bill Parrish, media tycoon, loving father and still a human being, is about to celebrate his 65th birthday. A dying teacher instructs his final student to check on the activities of five former pupils, each of whom he taught a unique and special style of kung-fu: Centipede, Snake, Scorpion, Lizard, and Toad (hence the title). One morning, he is contacted by the inevitable - by hallucination, as he thinks. His final student, who knows a little of each style, must team up with one of the other good students to destroy the evil ones, if there are any. Later, Death itself enters his home and his life, personified in a man's body: Joe Black has arrived. Greed and treachery ensue as the student discovers that some of the students are indeed evil, but which one can he trust enough to team up with? His intention was to take Bill with him, but accidentally, Joe's former host and Bill's beautiful daughter Susan have already met. Joe begins to develop certain interest in life on earth as well as in Susan, who has no clue who she's flirting with." I Miss Being in Control of My Emotions is a body of work articulating personal and political narratives surrounding addictions, relapse, trauma, and recovery through the manipulation of found objects and reuse of material. These sculptures exaggerate forms of support through an intentional play on fragility. Few of the works are structurally sound. Their precarious existence references a sense of stability they wish they had; industrial materials haphazardly bound together in an excess of rope and rubber. They mock their own lack of control over their existence. A deliberate narrative in which objects gaslight themselves into a state of uncertainty. Ceramic and cast objects throughout the installation decontextualize consumer products and household cleaning objects using engraved text to create loose poetic narratives and one-off aphorisms about drug use, recovery, and mental health. My works have a self deprecating quality to them, they mock their own fragility, and their position in a liminal space of never being complete. The objects I make are sometimes specific references to cultures of drug users or recovery communities - like the cast Naloxone kits scattered throughout the installation, placing the crack epidemic of the 80’s in conversation with the current opioid crisis. Some of my objects are inside jokes about sobriety culture - replacing an over-indulgence in drugs with cheese and other salty snacks, Perrier sparkling water replacing alcohol, kombucha and the fear of becoming a hippy in sobriety. My practice focuses on the impermanence and delicate nature of memory through material, and drawing from personal familial experiences. I express these ideas through a mix of found materials and labor intensive practices including weaving and women’s handy craft. My upbringing in British Columbia, Canada has had a strong impact on my aesthetic sense. I’ve spent much of my life surrounded by mountainous landscapes, and most of my childhood memories are outdoors. My love of nature consistently finds a way into my work. I incorporate local found objects or materials whenever possible. Entwined is made of fallen branches and logs from the environment which have been woven back into a living tree. My hope is that by integrating the installation into this tree, it will eventually become consumed by the branches, leaves, and animals that dwell their. 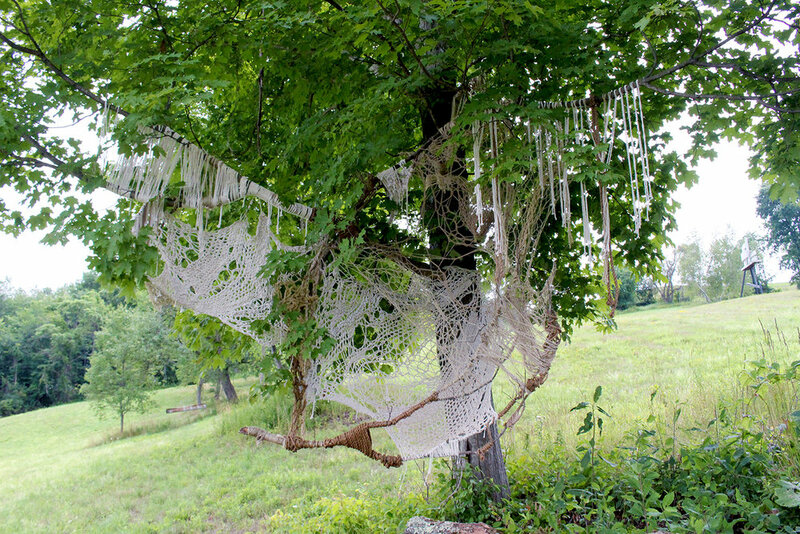 Natural ropes, twines, and string were chosen to weave, wrap and knit into the tree in order to obscure parts of it while trying to mimic natural forms like webs and nests. With this piece it is my hope that it is eventually taken back by its surroundings and becomes used by the creatures that live in the area, adding to the countryside without interfering with its growth. My current body of work explores emotions through exaggerated poses. Petrified accomplishes this through the strained posture of a humanoid figure. My hope for this piece is that the viewer relates to the pose and feels what the sculpture itself is ‘feeling.’ I want it to appear as though there is a presence reflecting back at the viewer, something almost alive. I chose this pose because it is a complex stance which contains the potential to be perceived in several different ways. Some may feel fear emanating from it, while others may interpret it as a giddy cheer. Petrified alludes to the material used, as well as the still frame of strong emotion that the sculpture portrays. The site for this piece is important. The wood I used to make this sculpture is of a light tonality and as a result it stands in stark contrast to the lush, green forest surrounding it. This landscape makes the sculpture appear as if it is sticking out, and if you can catch it at the right time it appears to be glowing. My hope is for that feeling to resonate with the viewer as a way to connect and relate. I created these objects and spaces of play with the intent to twist the viewers perspective. I approach this process as if I were making a two- dimensional drawing of an object rather than fabricating a sculptural form. These play sets - drawings made real - are inaccessible, denying the act of play conjured in the viewers mind. These installations are reminiscent of childhood playgrounds, now warped by memory and disintegrating, just as the rust on my sculptures cause deterioration. I reference everyday objects that explore the notion of playing house. The labor of craft is often unappreciated in our digital world, however, craft is a vital component of this work. For me, it is a means to articulate touch and time. Although my upbringing was in the industrious province of Alberta, my art honors women’s work within the male dominated world of sculpture. In To Touch To Feel, I use large steel grates to reference the supports used in needle point and rug hooking. They masquerade as soft woven fiber but remain rigid and demand attention. The steel will endure time, but the yarn and wool fibers will not. They read, To Touch Everything, To Feel Everything, a simple and powerful phrase by my collaborating artist, Emily MacDonald. It is quietly beautiful, reminding us to take a moment to absorb it all, for the gentlest of gestures can be meaningful. This work is an exercise in using folk motifs, Dutch floral design, and emotional figural imagery in exploration of the historic and contemporary aesthetic of tarot and religious objects. Ceramic as a medium invites a viewing of the pieces as functional art, while challenging the viewer to ask what the function could be. The shape of the pieces are inspired by religious iconography and stained glass. The floral motifs undulate between Canadian flora and the symbolic “flora” used in decorative porcelain, in consideration of whether the specifics of plant species alters the understanding of the works. The pieces are obviously shaped by hand, no pains were taken to render the works as if they were mechanically produced, thus a further consideration in the lexicon of folk art. The works are meant to be exhibited as an installation, each piece informing the next. This project allowed exploration into new tangible territory, pushing size and surface decoration. As I usually work in two dimensions, the attention to the physicality of the surface altered the direction of composition and content.